When thirteen-year-old Max Tilt stumbled across his great-great-great-grandfather Jules Verne’s unfinished, unpublished manuscript, The Lost Treasures, he thought he had the answer to all his problems, but nothing in life is ever that easy. With his mom’s illness getting worse again, Max needs to figure out a way to save his family—now more than ever. So Max and his cousin Alex revisit The Lost Treasures, and they find a clue that just might be the key to a cure. It’s the story of Verne’s seemingly impossible recovery from a near-fatal gunshot wound. Somehow, after being shot, Verne didn’t just survive, he thrived. And the book hints that he was only able to do so after collecting magical healing elements that he’d saved from a race around the world. 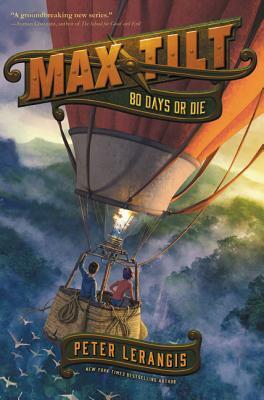 Piecing together hints from Verne’s Around the World in 80 Days and his lost manuscript, Max and Alex realize there’s a way to save Max’s mom if they’re daring enough to try. It’s a race against time in the second installment of the action-packed adventure series from master storyteller and New York Times bestselling author Peter Lerangis.